I've been intrigued by the Platinum #3776 Century pens for some time, but Platinum's extensive use of gold accents (somewhat ironic, given the name of the company) held me back. 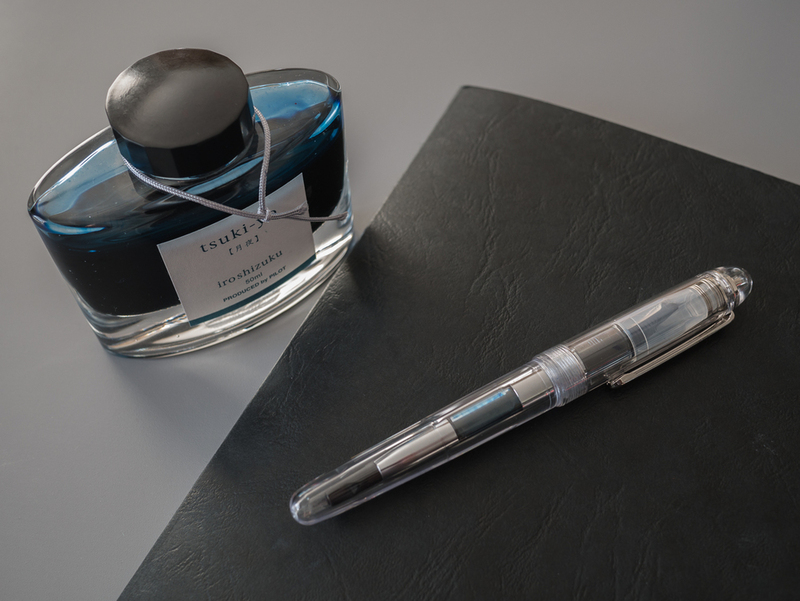 Back in July, Platinum released the #3776 Nice, which replaced the gold trim with even gaudier rose gold, but something about that particular pen stuck in my craw. I've only been to the French Riviera once, and I spent most of the trip at a software trade show. But I was intrigued by how the much the style of the #3776 Nice took me right back to that place in time. I eventually realized that it was pretty dumb to buy a pen that I really didn't like the look of just because it made me feel something, but by that point I had caught the Platinum bug. Some digging around at Pen Chalet led me to two earlier #3776 special edition demonstrators, the Sai and Shoji. Both have the "correct" color furniture and look great all around. I jumped on the Sai, and I'm glad I did. The #3776 Century series pens all share a fairly traditional cigar-shape design, but as a demonstrator with some unique flourishes, the Sai stands out from the pack. As you may know, the "3776" in the series name refers to the height of Japan's Mount Fuji in meters. The name Sai, and the pen's clear design, refer to Lake Sai, one of five lakes near Mount Fuji. Whether or not you buy into the backstories that pen manufacturers dream up, there is no denying that the Sai is a very sharp demonstrator version of one of Platinum's iconic pens. While the design is fairly minimal overall, there is some nice detail work in the pen body that makes the Sai more than just a clear tube. The style of the nib is also very distinctive and appealing. It's fairly large in size, and I love how the engraved lines look more modern than the scrollwork you find on most fountain pens. At a quick glance, the Sai could be confused with an entry level demonstrator. But once you pick it up, you feel the difference. 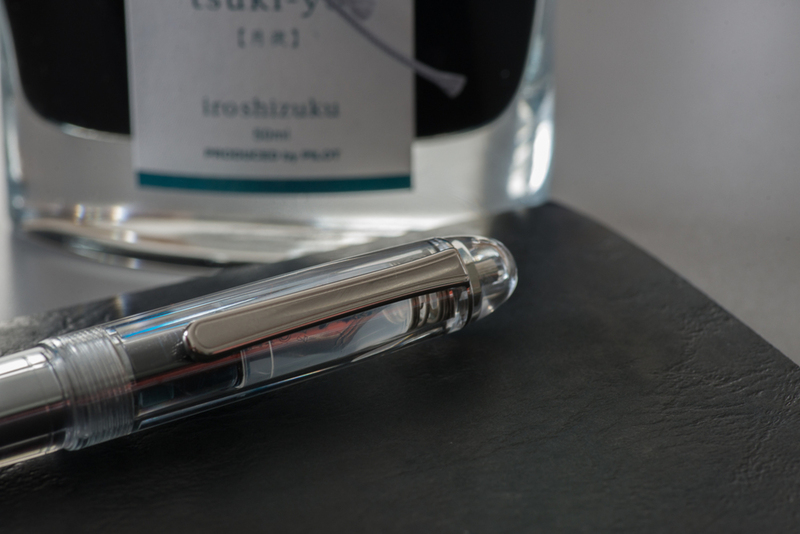 The pen is constructed with a clear resin that has a very solid feel to it. This premium feel carries through to other details like the threads and the clip. The clip is visibly bolted to the top of the cap, which both looks cool and provides comfort that it isn't going anywhere. 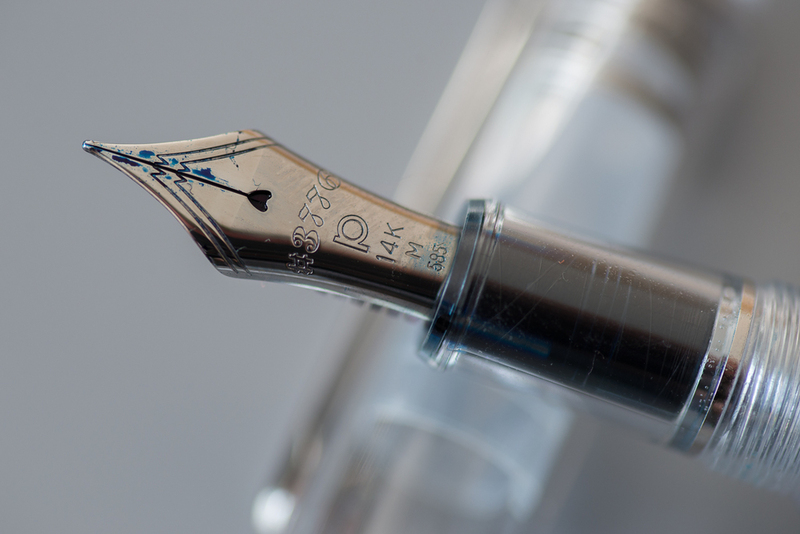 The Sai's cap includes Platinum's "Slip and Seal" mechanism, a spring-loaded inner cap that forms a seal around the nib when the pen is capped. Platinum bills this as a way to use a broader range of ink, including their own pigment ink offerings, with fewer drying issues. I haven't left my pen unused for extended periods, but it does seem to function well during capping and uncapping. My only complaint with it is that the opaque plastic material it is made out of detracts a bit from the otherwise crystal clear look of the pen. The #3776 pens are inked up using Platinum proprietary cartridges or an included converter. I think this is generally a good choice for the #3776 series as a whole, but the clear special edition models scream for ink sloshing directly in the barrel. I did some Googling to see if anyone had done an eye-dropper conversion with this pen, but it appears that the metal parts inside the barrel are a concern. On the plus side, the included Platinum converter does look nice inside the pen, and you have a good view of ink level at all times. 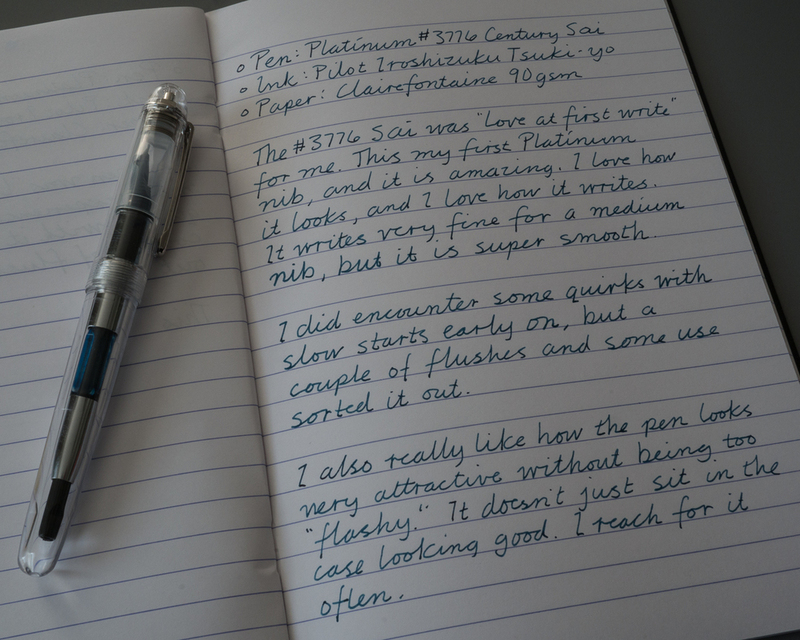 In addition to looking great, the Sai's rhodium plated 14k gold nib is a dream to write with. I opted for a medium nib, but it's a very fine medium (even by Japanese pen standards). That said, it's also a very smooth writer. While it usually takes a me a little time to warm up to a new pen, I loved writing with the Sai right from the jump. I did hit some occasional hard starts early on. This was a bit frustrating, but it was infrequent enough that I was confident that I could work it out. Sure enough, with some usage and a few pen flushes, the issues disappeared completely. The Sai is an average size pen that is comfortable for me to write with both posted and unposted. One of things I really appreciate about the Sai is that it's a high quality pen that begs to be used. While it's attractive, it feels more at home in my daily rotation than in a display case. The Sai is relatively straightforward to disassemble and flush. My bulb syringe doesn't form quite as perfect of a seal as it does with some of my other pens, but it's still pretty easy to clean. The fact that the grip is clear also makes it really easy to see whether the pen is fully flushed. The Platinum #3776 Sai retails for $270, a premium over the standard #3776 models, but Pen Chalet is presently offering it at $216. You can pretty easily drive that down under $200 shipped with readily available coupon codes as well. The Sai is a good value at that street price. You can certainly find flashier pens in this price range if that's what you're looking for. But the Sai is a high quality pen with a 14k gold nib that I'd match up against pretty much anything else out there. The Platinum #3776 Century series has a great reputation, but the traditional cigar shape and wide use of gold furniture always held me back. If your tastes are similar to mine, the special edition demonstrators are a great way to add a #3776 to your collection. While I'm happy with my selection of the Sai, the blue-tinted Shoji also looks quite stunning. You can find a video of it on Pen Chalet's #3776 product page. In addition, Platinum also recently announced a new addition to the Nice series: the #3776 Nice Pur. This pen shares the same general ornate frosted demonstrator stylings as the original Nice, but it swaps the rose gold trim for rhodium plating. Pen Chalet confirmed that they will be adding the Nice Pur to their catalog in the coming weeks. 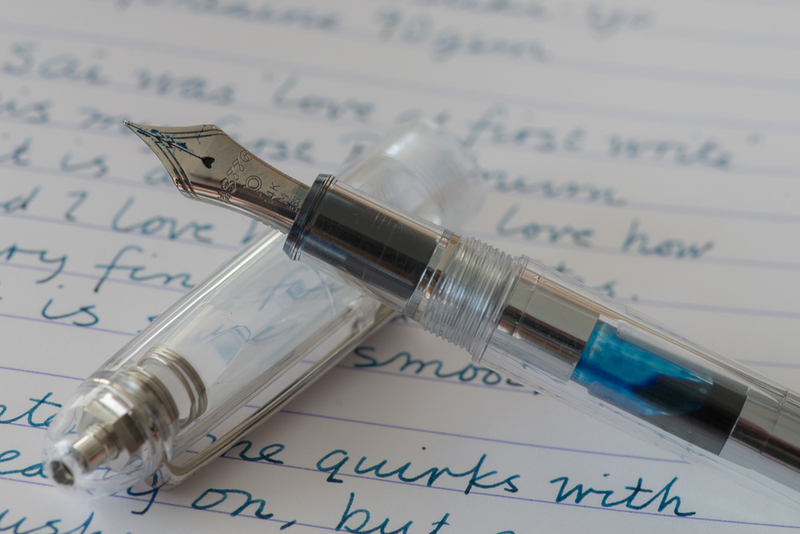 While I am very happy with the #3776 Sai overall, it also has me thinking a bit about a Pilot Custom Heritage 92 acquisition. Pilot nibs are also fantastic, and the Custom Heritage 92 includes a piston-fill mechanism for more ink sloshing goodness than the #3776 demonstrators. 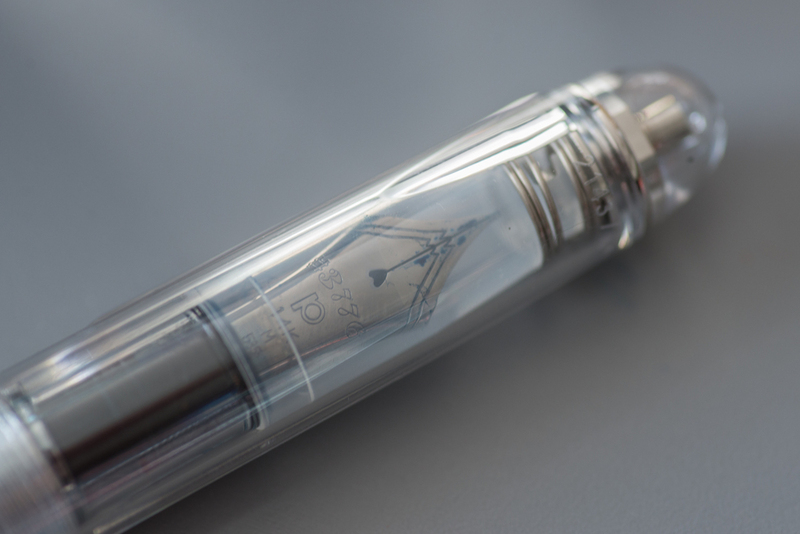 So, you may want to comparison shop that as well if you're considering a Platinum #3776 demonstrator. Disclosure: I purchased this pen for myself, but Pen Chalet extended a special discount for the purposes of this review.